Preheat oven to 375°F. Unwrap the crescents. To each crescentadd a small slice of cheese a slice of corned beef, and a tablespoon of sauerkraut. Roll the crescent up and place on a baking sheet lined with parchment paper. Repeat with all crescents. Bake 13-15 minutes until crescents are golden brown. Remove crescents from oven and let cool for a few minutes. Serve with thousand island dressing for dipping. 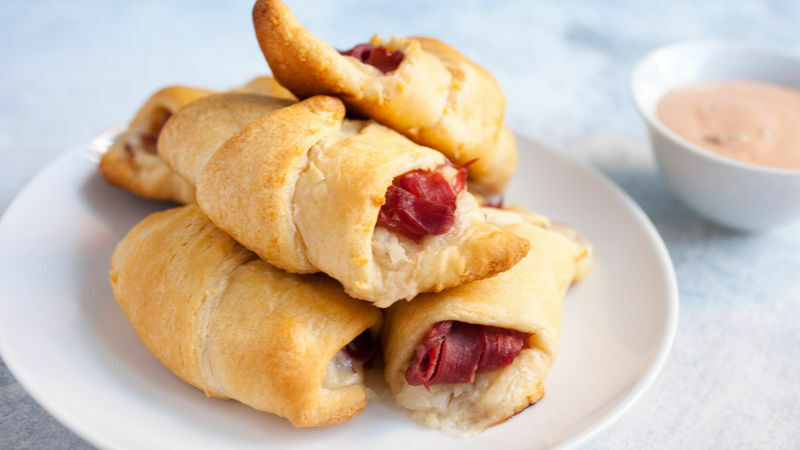 These Reuben rolls are one of those recipes that’s almost embarrassingly easy to make, and has just a few ingredients, but is so delicious. It’s great for those times when you need an impromptu appetizer idea, like, five minutes ago. You’re gonna love it! The wrapper for these guys is your normal Pillsbury™ refrigerated crescents, maybe the most versatile appetizer ingredient on the planet. Is there anything you can’t put in a crescent? But this Reuben filling is at the top of my personal list. I just love the mixture of creamy cheese, salty corned beef and fermented sauerkraut. It tastes like the real deal and when you dip in thousand island dressing you get one delicious appetizer. There isn’t much too these, but trust me that they are a huge hit and your guests will be singing your praises. Reuben on, friends. Reuben on.